Hi – I enjoyed reading your informative article on Timpo toys. Do you have any Timpo trucks for sale? Thanks for your comments so glad you enjoyed my post but sorry to say no Timpo trucks available at the moment. If you tell me which ones you are looking for I will see what I can do. All the best for now, David. Hi there Pete, is it normal ? In my opinion no its not. Certainly Timpo vehicles are often seen with a fair amount of paint loss, but like all older metal vehicles it depends how well they were looked after. I wrote in an earlier article how as kids we threw stones and hard clumps of earth at our Dinky military models and even shot at them with our air pistols !! anyone picking up one of those toys now would say its well playworn !!! but they were toys and meant to be played with. On the other hand I have had many Timpo vans and trucks, some boxed some not, but all in good to excellent condition, complete with good decals where appropriate. Lets face it you will get what you pay for but I repeat as far as I am concerned its not normal to have paint loss to one side only. Thanks for visiting and your question, hope this helps, David. I have “scored” a Timpo ESSO petrol tanker in well worn condition but wheels are OK, just needs new tyres. Should I repaint it and are the ESSO decals available? To be honest I don’t know how to answer this question … I suppose it depends what you want to do with the finished model. Lets be honest an unboxed Timpo model won’t fetch a million whether its in poor but original condition or whether you repaint it. However if you do repaint the model again it will need to be done properly .. model stripped, primed etc. etc. As for decals … sorry but I don’t know anyone off hand who produces replacement paper decals for Timpo models. There are several people on the internet selling Dinky Toys decals. Dinky obviously did an ESSO tanker, the wording and logo were the same as the Timpo model so they may be suitable for you. Another option for you to consider and one I would personally go for is to do your own Code 3 model. Instead of ESSO look for an alternative logo .. repaint in a totally different colourway than the usual Timpo models .. what about green with CASTROL decals ? Let us know how you get on, pics appreciated. Hi I just found your most informative website and wonder if you can help me? I have just bought three Timpo racing cars – the same model as the three shown in the front line of your website photo and quite similar to the Dinky Speed of the Wind. Could you advise me of an approximate date for these models please? It’s hard to be specific about the dates of the Timpo ‘Speed of the Wind’ record cars. I do know that they appeared in the boxed Timpo Petrol Station Set and the Racing Car Set which were introduced from 1946 onwards but as they are probably the most common of all the Timpo vehicles I think its fair to say they must have been sold individually. So I would suggest a date range between 1946 to 1955 would be a good guide. My interest in Timpo is their link with “Skybirds” (Givjoy). You indicate Timpo’s premises to be in Westbourne Grove. As you can tell by many of my company listings I tend not to go into great detail on their history, more like a simple thumbnail background to each one. If I was to do more I might as well sit down and compile a book on the subject whereas this site is just meant as a general overview on the subject. As you will appreciate the history of many British toy companies is difficult to follow, many of the early companies being interlinked etc. etc. I source much of my information from the listings obtained from the exhibitors of the early British Industries Fairs. The Information gives me Toy Importers based at 26 Westbourne Grove, London W2. With a Telephone : Bayswater 7251 (6 lines), Cables : ‘Timpo, London’ (1947). This information is also confirmed in ‘The Great Book of Hollow-Cast Figures’ by Norman Joplin with a date line of 1945. Without delving further it may well be this was an office/admin. address with production based somewhere else ? however I have no info relating to a factory at Catford. Further confusing is the info I have is that when the Taylor Barrett factory at East Finchley was destroyed in the blitz they transferred production to a factory in North Finchley ! Can of worms methinks …. can I resist trying to resolve this ? Wondering if you have any information on the Timpo Open Top Roadster? I always thought the car was based on the Brtish Jowett Javelin but have been told that was wrong and was in fact based on the American Lincoln Continental. I will let you make up your own mind on that. 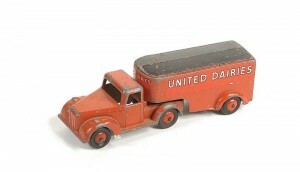 Dates to around 1947 or so, diecast metal with a seperated tinplate base. Stamped to the underside of the front bumper casting with Timpo Toys and Made in England underneath the rear bumper. As far as I am aware the model came in red, green and blue colourways and maybe brown ? Seats were cast-in to the model which had a separate pressed aluminium windscreen. Both axles were fitted through cast-in pillars and had crimped axle ends. I think that’s about all I have, let me know if I’ve missed anything. PS Like your other profile pic but thought better not ! 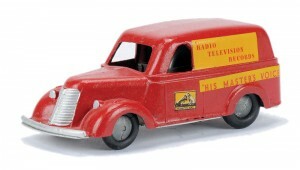 Hello, At the age of 70 I’ve just acquired the Timpo van model my uncle had on display when I was a child. My uncle and dad both drove for Chivers Jellies and this van has the logo’s on the side which look very like the ones on the side of the Dinky Trojan except it is in the correct dark green/blue of the real Chivers livery and not in the incorrect Dinky grass green livery. Did Timpo make a Chivers liveried van or is the model I so coveted as a child a hybrid of Timpo casting and Dinky transfers? I can vouch that the model was already well playworn when I first got to see it in around 1955. Regards John Sharp. 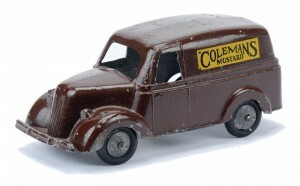 Hi there John and rest assured Timpo did indeed produce a Forward Control Box Van in dark green colourway finish with Chivers Jellies transfers sometime around 1949, the model being later re-issued by Benbros. Unlikely that you will ever find one in anything other than good condition, if you could find another that is, and the only reference I have for one at auction was back in 2014 when one sold as part of a ‘job lot’. Now you can give it pride of place knowing ‘Its a Good ‘Un’ as we say in Yorkshire !